Discussion in 'Archived Reports' started by Skylon, Feb 6, 2019. 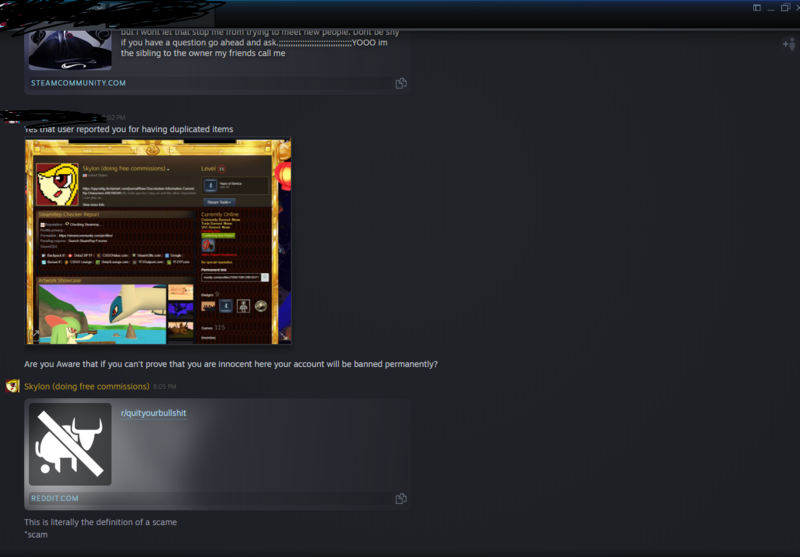 Posted a "Valve Report Assistance Team", threatening to ban my account over "Duplicated Items"... Friend said "i might reported you for duplicated items instead of someone else and the admin gave a warning about the ticket i send. Was this the first user you were talking to that started this event? no I mean did ANOTHER user link you to this user? Who was that if so? Thanks - issue is I can't confirm you were ever friends with this exact user by SteamID - all I see is a chat box with a name and profile image. Need to verify this and you can do that with a screenshot of your friend/user activity thru a web browser - when you take this and it shows you adding the user hover your mouse pointer over the users name so it shows the popup of the profile. Make sure you open this in a web browser before doing anything rather than steam client. Take the screenshot and make sure it's Full Screen, not edited or cropped in any way! Upload HERE…NOT imgur, NOT gyazo or any other 3rd party hosting site! @Skylon Please don't abandon the report. @Skylon 24hours to follow up - don't abandon the report. That isn't what I asked for. I'm accepting as is but the other user apparently you can't prove you were ever involved with..and that was the user you should have reported to start with. Makes things majorly delayed and hard to investigate like this when its backwards.